This film reminds Fikri Jermadi why it’s important to face up to the lies and get at the truth. ‘Tangerines’ tells the story of two farmers, Ivo (Lembit Ulfsak) and Margus (Elmo Nuganen), caught in the middle of a war zone. Their village in Abkhazia was being fought between the Georgian and Abkhazian sides, so it was of no surprise when Chechen mercenaries (fighting for the Abkhazians) turned up on Ivo’s doorstep asking for food. One of them, Ahmed (Giorgi Nakhashidze), later survives a firefight, and Ivo cares for him in his house. As Ivo and Margus proceeds to bury the dead, one of the corpses turns out to not be a corpse at all. He is Niko (Mikheil Meskhi), a Georgian fighter who is severely wounded. Like Ahmed, they brought Niko back to Ivo’s home, to care for him as well. As you can imagine, Ahmed is not best pleased about this development, and the conflict for this film really began from there. The whole situation really is a basket case. I say the conflict for the film, because the truth is the conflict that drives the story for both Ivo and Margus occurred prior to the film’s start. In the beginning, we see Ivo carefully cutting up pieces of wood to make boxes for Margus’ tangerines, of which there are plenty. The story follows on from there, but the point is that we are plonked down in media res. Quite frankly, I did not really understand what was going on to begin with, but I appreciated how the filmmakers did not take the time to spoon-feed me every single bit of information at the start. Save for a short title card providing some context, the rest of the film treats the audience in an adult and intelligent manner, trusting that they will pick up more than enough to understand it. I certainly felt like I did, even if a certain lack of knowledge about the situation jars me at times. It was only later did I learn of Ahmed’s political leanings; his religious slant is also not made obvious until he said something along the lines of Allah. Now, of course, the word Allah itself can and has been used by many to connote a god other than what Muslims believe in, but here it serves as a useful reminder of a bigger picture we are not necessarily shown. Would the knowledge of this bigger picture have helped in our comprehension of the film? I suspect it would certainly allow for us to get at the more nuanced parts of the film. For example, Niko hides his Christian cross hanging from the neck when he notices Ahmed looking at them. It hints at another layer, another dimension I am not as aware of; I know that people fight for many different reasons in Eastern Europe, but in the back of my head, my ignorance had pegged that along political lines rather than outright religions battles. Another example also shows itself in their constant reference to Estonia. Again, I am aware of both countries, but I did not really realise how close they are to one another. Beyond Mart Poom, who made his debut along with Paulo Wanchope for Derby County by beating Manchester United at Old Trafford, I realise I did not and do not know much of the country. He was admonished for trying at home what the WWE told him not to. In that sense, this movie serves as a nifty little introduction that humanises an aspect of a war many people may not be as aware of. This is essentially an anti-war film set in the middle of war, with Ivo’s home serving as the perfect metaphor for the imagined communities both Ahmed and Niko fought for. I found it particularly delicious how they were portrayed as very cantankerous neighbours, both invalids living in rooms next to one another, but without a civil bone in their body to allow for a more adult approach. Ivo, in many scenes, plays the paternal father of sorts, the one figure both men respect well enough to at least promise not to kill each other for. It hints at how the war fought between the two sides is an immature effort at best, one that has resulted in much senseless loss of lives. Ivo’s somewhat pacifist approach helps to soothe and heal both men, not only in the physical sense but also to further humanise them; in another somewhat-meta moment, Niko reveals to Ivo that he is a theatre actor before the war. “In movies, too?” “No, nobody makes movies anymore. There’s no support for it.” Is the director speaking through his characters here? I would not be surprised if this semiotic approach has been taken. Going beyond the house as a home and country, I also see it as a kind of purgatory, the period of waiting for both men. Ivo is the angel, the one man in the middle of war who would not compromise on his principal in a quiet but authoritative manner. How about that? I’ve compared him to both a parent and an angel; photos of his family in and around the house hints at a spectre of something far more important that what meets the eyes. He really loves those tangerines. What of the titular tangerines, then? I believe them to be a representation of what it means to belong to a land. Margus and Ivo works hard to pluck as many as they can, but for what purpose? What kind of economy operates in a country where the next bomb could literally land on your head, taking your life without you even knowing about it? 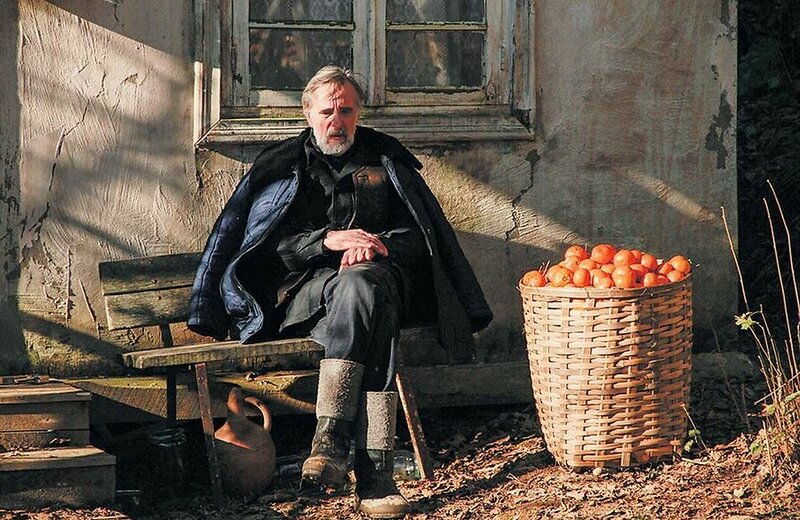 “This is a war over my tangerines,” Margus lamented. “Relax,” said Ivo. “They are fighting for the land.” Margus turned to Ivo. “For the land where my tangerines grow.” Both the land and its occupants, human or otherwise, are one and the same, which again serves as an important reconfiguration of the imagined consciousness. If it is not obvious enough, I shall end by saying that I really like this film. That may already seem obvious by now, but I like to state the facts as they are. This is an incredibly well made film, with strong performances from both sides. 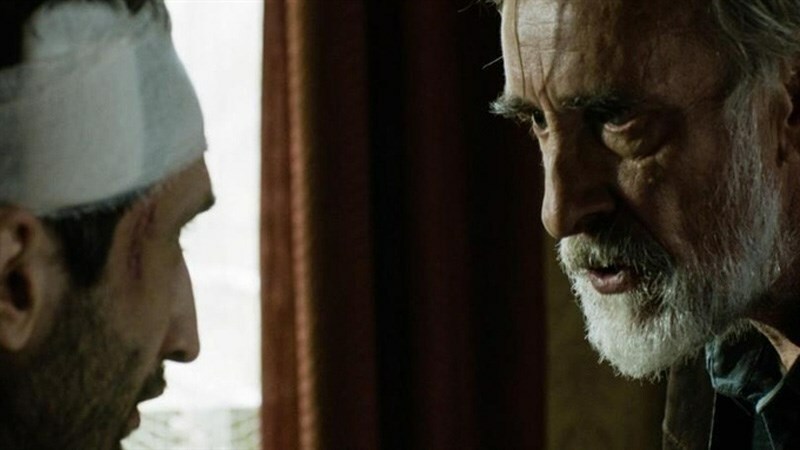 Some are subtle, some are louder, but everything made for a finely balanced film that serves as a representation of the futility of war. Urushadze is a director who knows what he’s doing. The camera moves ever so subtly, even in the quieter scenes, at times raising the stakes for us without us even knowing it. It stops at strategic points to hammer home its point, the camera’s stillness and the character’s silence telling us everything we need to know. Cinema may be a big lie, but it is not without its universal truths. I believe ‘Tangerines’ to be one of them. Fikri really, really likes the soundtrack, so instead of the trailer, let’s listen to some proper music for once. ‘Tangerines’ is nominated in the Best Foreign Language Film category at the 87th Academy Awards. It was nominated in the Foreign Film category at the 72nd Golden Globes Awards.